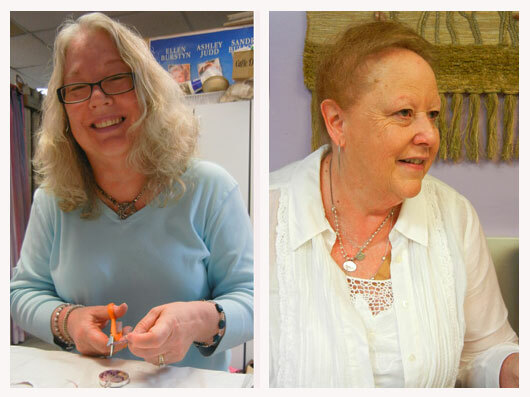 My sister, Janet, sister-in-law, Kathy, and I met up in Augusta to enjoy some creative play time this week with an Ice Resin class at YaYa Beads. Great fun! Kathy was a natural and created some really fun compositions. We all agreed her lovely dimensional pendant (top) took the Fabulous Award for the day. (Wish I'd snapped more photos of her work!) Janet's pieces (center panel) reflect her love of music and her gift of encouragement. I just love the flecks of torn ribbon in her second piece. Now that I have my first pours (bottom panel) under my belt, I'm ready to dive into Deryn Mentock's Bezel Bootcamp, an e-course in bezel making, soft soldering and resin. If you're looking for a great way to broaden your jewelry making skills, registration is still open! It was such a fun day! I loved meeting your family, and watching you guys make you creations! Glad you had a good time! Can't wait to see what you create in the e-course! I am so glad you all had such fun. So nice to meet everyone, and it put a nice touch to reading your blog, now that I know you. It would be such fun to get together and have a stitching day. Excited about seeing your cab challenge piece. I have started mine, which is really a big surprise, not waiting until the last minute. They are awesome, Karin... they look like little stories encased in time! these are so much fun! you'll have a great time adding them to your neck jewelry piece! I am in the course by Deryn Mentock Bezel Bootcamp and just loving making the bezels and using resin!! Looks like you are off to a great start ! !